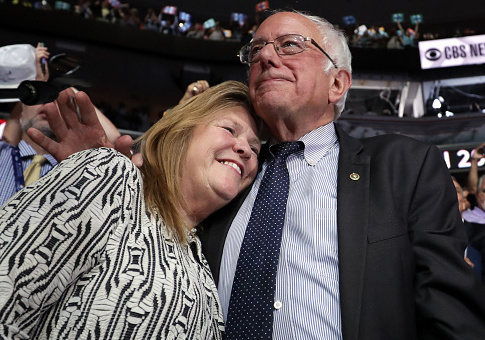 Jane Sanders, wife of Sen. Bernie Sanders (I., Vt.), has hired attorneys to represent her in a Department of Justice probe of her time as president of Burlington College. A former Burlington employee who coordinated the school's response to an FBI subpoena in February 2016 said that she was contacted by Sanders's lawyers, VT Digger reports. The probe concerns a land deal Sanders conducted while she was president. Coralee Holm, the former employee, said that the lawyers "wanted information on what I had been asked by the FBI. They were trying to get clarification on what the accusations are because they had not been contacted by anybody as to an investigation." She received a call from Burlington attorney Rich Cassidy in late April or early May. She also received one from Jennifer Windom, a lawyer with a D.C. law firm, in late May. Two former Burlington trustees also said they were contacted by Sanders' lawyers. The controversy centers around a $6.7 million loan that Sanders obtained to purchase a 33-acre campus for the school. The loan agreement required that Burlington show at least $2 million in collateral. But three of the donors, including the largest, said their pledges were misrepresented. Between 2010 and 2014 the college collected only $676,000 in donations, and it was unable to enroll as many students as Sanders had projected. It closed in May 2016, with debt from the land purchase cited as a primary reason. The FBI was reviewing Burlington's financial records as recently as February. This entry was posted in Issues and tagged Bernie Sanders. Bookmark the permalink.